A Long Time Coming. Prof. Dave Spencer (standing, far right) spent more than four years working with dozens and dozens of AE students to design, engineer, and build the Prox-1 Satellite. 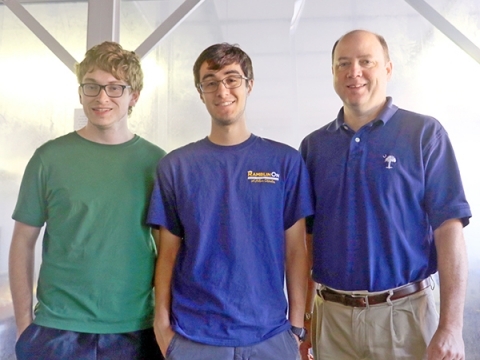 Two Prox-1 prototype shells are seen here, along with the students who worked on them. On May 26, Prox-1 -- the first-ever Georgia Tech built satellite accepted for a space launch -- was quietly loaded onto a FedEx truck headed for New Mexico. Thus ended more than five years of planning, designing, testing, and more testing by more than 200 AE students and faculty. At its next stop, the Air Force Research Lab, Prox-1 will undergo even more testing in preparation for a December 2017 launch aboard SpaceX’s Falcon Heavy rocket at Florida’s Cape Canaveral. “It will be quite a send-off,” says AE professor E. Glenn Lightsey, who is heading up the final stages of the $220,000 University Nanosatellite Program-funded project. Right now, there’s still a lot of work to be done. 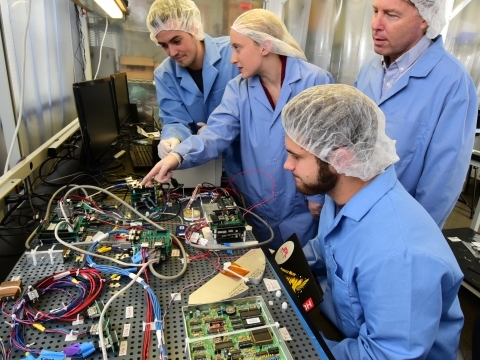 In New Mexico, AFRL engineers will perform vibration and thermal cycle tests to make sure Prox 1 can withstand the thunderous launch and the harsh space environment. 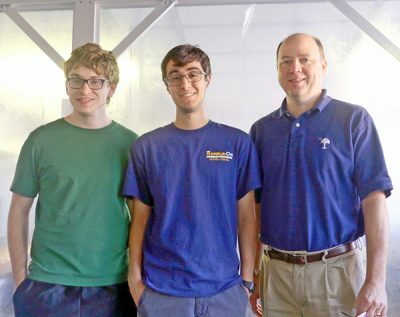 On the team of engineers trouble-shooting any remaining issues will be AE undergrad Warren Eshpeter who is interning at AFRL as a small satellite systems engineer this summer. The Farewell Team. (from left) Undergrads Kyle Scott and John Amin with Prof. E. Glenn Lightsey, the Prox-1 PI stand outside the SSDL 'clean room' where final preparations for Prox-1's departure were completed..
"When Prox arrives I’ll be involved with unloading our hardware and ground support equipment, and I’ll attempt to solve issues with the command and data handling stack,” says Eshpeter, who just finished his second year at Tech. Back at Georgia Tech, John Amin, Kyle Scott, and Grayson Huggins will be monitoring their classmate’s work in earnest. 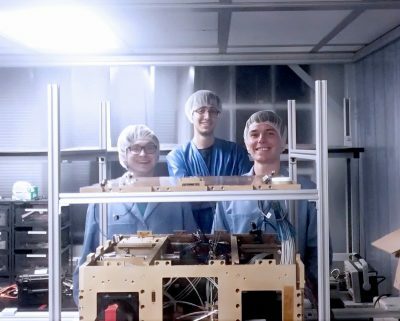 In the weeks leading up to Prox-1’s departure, these three student researchers volunteered countless hours to assemble, test, and package the satellite for its final departure from Tech. The result of their work hardly looks like the stuff of sci-fi fantasy. Prox-1 is a 154-pound, rectangular-shaped metal box measuring roughly 24” by 22” by 12”. Its solar panels are too delicate to be touched by bare human hands, and the actuators, microcomputers, and sensors contained inside must also be gently handled and precisely placed to ensure proper functioning. “We were here, in the lab, pretty much, seven days a week for the past month,” says Amin, who took just one day off to celebrate his own graduation from Tech. Prox-in-a-Box. 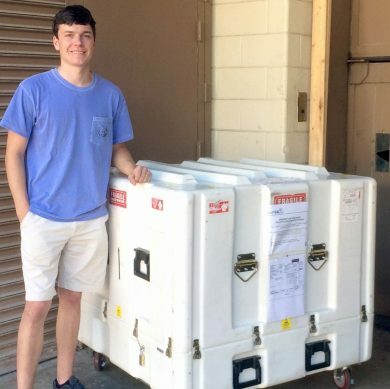 Undergraduate Grayson Huggins capped off the work of more than 200 AE students when he loaded Prox-1 into a box that was FedEx'd to the AIr Force Research Lab in New Mexico. Still sleepy from the all-nighter he pulled to prep the satellite's departure, Scott groggily echoed his colleague. Among other things, the team traced a software problem back to an incompatibility between an SD card and another computer. After consulting remotely with other Prox-1 engineers via a telecom, they decided to replace the SD technology with internal memory. The fix worked, but other glitches popped up as well. All of them took time. It was time well-spent, says Lightsey. Once in space, Prox-1, like all satellites, will not be accessible for a quick fix. Malfunctions could kill the project – or worse. The Prox-1 team is not worried about that now. The next phase of preparation – to be executed by AFRL engineers in New Mexico - includes more demanding vibration and thermal cycle testing that will ferret out more serious issues. The biggest unknown, at this point, is when, exactly, the Falcon Heavy will make its maiden voyage. A December 15 launch date has been circulated, but, as the Prox-1 engineers have learned, further testing of key components could push that back some more. Proper Attire Required. To prepare for their work on Prox-1, Kyle Scott, John Amin, and Grayson Huggins regularly donned hairnets, lab coats, and latex gloves before stepping on an ultra-sticky clean mat (to remove dirt). 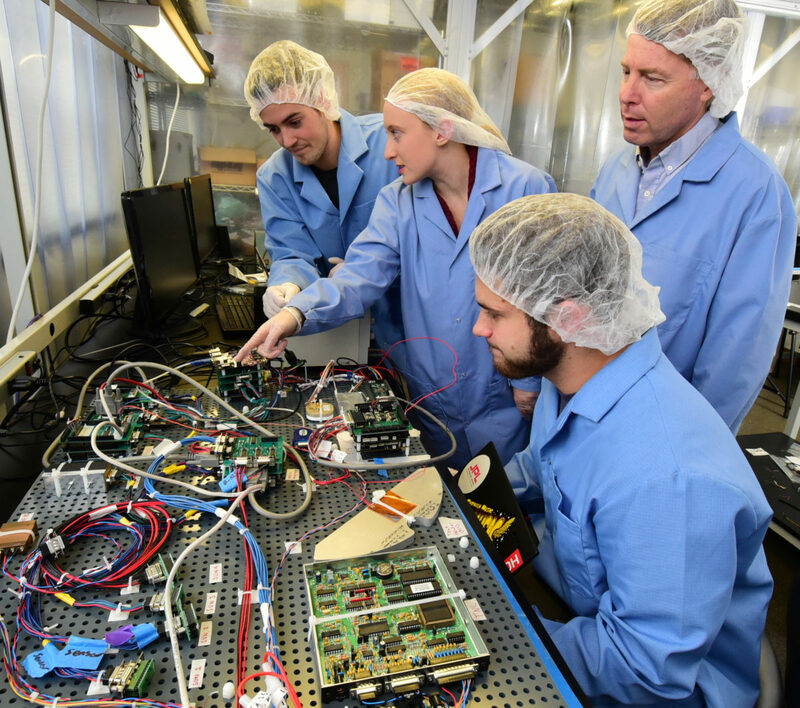 Once deployed, Prox-1 will perform a series of self-checks, including the flight certification of a microsatellite control moment gyroscope unit, a lightweight thermal imager and a 3-D-printed propulsion system designed by Lightsey. Prox-1 will then deploy another nanosatellite, LightSail 2, which was designed by The Planetary Society to test the propulsive efficacy of a 32-square-meter solar sail. As that sail unfurls, Prox-1 will maneuver such that it will be able to observe the satellite from a short distance and acquire images of the glimmering structure in action. The success of this phase of the Prox-1 mission will be reason enough for celebration back on earth. Real-time tracking of one spacecraft by another is very tricky business. "And it will be great to see this come full circle," said LIghtsey. "We want our students to get experience that spans the entire cycle, from design to launch." The 2017 Prox-1 Team. 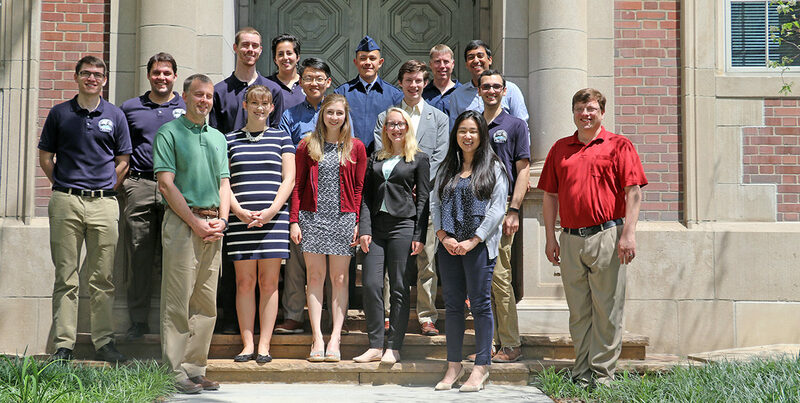 Several of the current students involved in the Prox-1 Satellite got together this spring when the first PI on the project, Dr. Dave Spencer, visited campus. With a history that reaches back to 2012, the Prox-1 project has engaged more than 200 undergrads and grads. 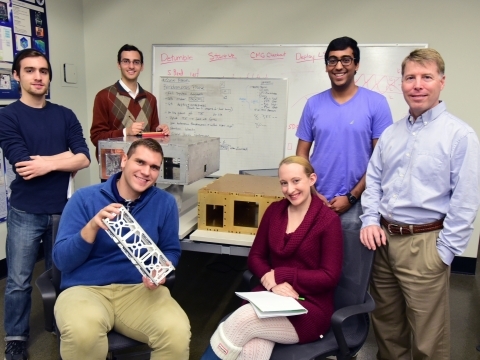 It is currently managed by AE professor Dr. E. Glenn Lightsey, a veteran of several satellite launches.